Artificial trees could be the most environmentally-friendly option, if kept and used year after year. Plus, they don’t drop needles. They also negate the need for that festive car journey accompanied by an aggressively spikey plant occupying 90% of your vehicle’s interior. But fake trees can be just a touch déclassé, right? My opinion is that if you’re going to go fake, either go for something that’s obviously not a tree, or something that apes the real deal extremely convincingly. Here are 8 of my favourites. This fulsome, good-sized pine will fool your visitors. Already adorned with pine cones and berries, it needs only minimal decorating. Far superior to cheap, Argos-type fake trees. Though it’s less lusciously-pined than the Dobbies tree, this B&Q beauty makes up for it in the totally convincing realism stakes. At 6ft, it will make an impression in most rooms. If you want something that will look stylish and make an impact, but aren’t worried about having a realistic tree, this super-quick pop-up option is the answer. Would work very well in a modern, uncluttered interior. 100% pre-decorated, you’ll have it read in seconds. This spiral tree is totally magic. Best of all, it’s safe to use outside. Just a touch nicer than those garish Santas we see flashing away on people’s houses, don’t you think? These retro, table-top trees are perfect for smaller spaces, or just homemakers who aren’t attached to the idea of a gigantic Christmas tree. An elegant design, which is fun for children to assemble. Got a big space to fill? Need a tree with presence? Homebase’s Icelandic fakies are the kings of tree-artificialdom. Sure, no-one’s going to believe that’s real snow, but this is a tree with bags of appeal nonetheless. Another tree that creates plenty of impact, while imparting a traditional festive feel. What I love best about this tree are its long, tendril-like branches. 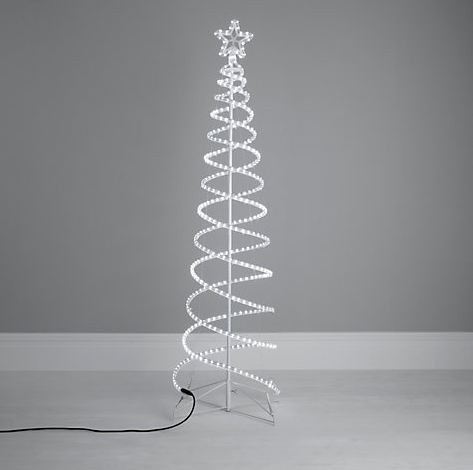 Another modern, pared-down tree design that will work in a minimal interior, or as part of a magical outdoor scene.